Let’s Greenlight Echoes of the Fey: The Immolation! Today we’re proud release our first official trailer for Echoes of the Fey Episode 0: The Immolation and launch our Greenlight campaign with the hopes of releasing on Steam and other PC platforms simultaneously! Episode 0 is a short prologue to Echoes of the Fey that we will be releasing FOR FREE in early 2017. This installment will take our players back to before Sofya Rykov was a private investigator and before she could use magic. In Episode 0, Sofya is an officer in the Human Empire with a (relatively) cushy assignment, guarding non-essential Leshin prisoners in the fortified city of Onigrad. Of course, anyone who has played Episode 1 or read The Prophet’s Arm knows that Onigrad is hardly the safest place near the end of the world. The Immolation is also the first installment of Echoes of the Fey we are developing in Unreal Engine 4, utilizing 3d backgrounds and dynamic camera angles for dialog sequences. Transitioning to UE4 has been a lot of work–especially since we’re working with all new environments!–but we’re sure that the work we’re doing on this short project will help us in the future. And we think that both fans of Echoes and new players will enjoy this introduction to Sofya, Heremon, and the world of Oraz. 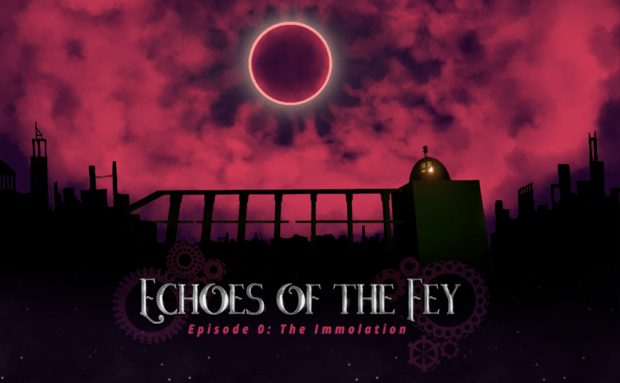 If you want to see Echoes of the Fey Episode 0: The Immolation, click the link below and throw us a YES!